Kosovo President Hashim Thaci said on Tuesday that only the peace agreement on border change between Kosovo and Serbia provides Kosovo with formal recognition by Serbia, the accession of Presevo, Medvedja and Bujanovac to the territory of Kosovo; this paves the way for Kosovo towards NATO membership, the European Union and the United Nations. According to him this agreement implies new recognitions. 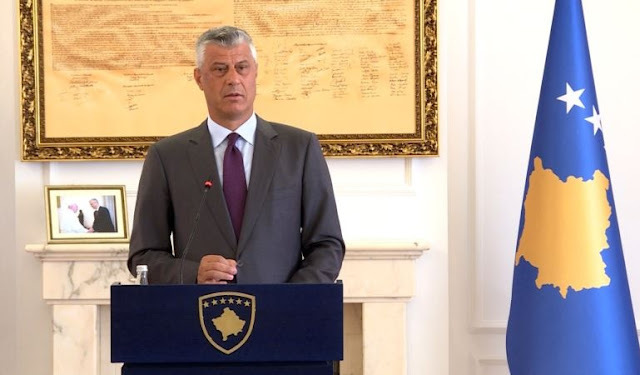 Thaci made these statements at a press conference, adding that if a peace agreement is reached, the same will be fully in line with international law, which according to him, also contributes to the stability of the Western Balkans. "And there will be no border correction along the ethnic lines, there will be no exodus of the population and no domino effect as to the stability of this part of Europe. I repeat once again, border correction between Kosovo and Serbia, as two independent states that would recognize each other as states, will be an integral part of the border demarcation of 430 kilometers long, whenever it will happen peaceful agreement between Kosovo and Serbia," added among other things Thaci. The dialogue between Kosovo and Serbia with the easing of the European Union has started in 2011 in Brussels, and aims to normalize relations between the two states.